I love this little diatribe against animal rights activists because it shows how little has changed in the last 50 odd years. If this guy is still alive I’ll bet he’s working for Fox News. He uses the exact same techniques they do. People who don’t strongly support vivisection “hate humans”, much like liberals “hate America”. He sets up straw men and creates fictional arguments to knock down, for example stating that anti-vivisectionists are against counting a cat’s heartbeats. Really? Because his title for them seems to imply that their primary objection is to cutting open and dissecting live animals. The other truly modern part of this letter comes in the first to last paragraph. There the author explains that if you speak out against the animal-rights movement you will be tortured just like those people in the Nazi death camps. It looks like Godwin’s Law was alive and well long before the Internet. This article was written just 4 years after the holocaust and already liberals are Nazis. DO you like dogs? 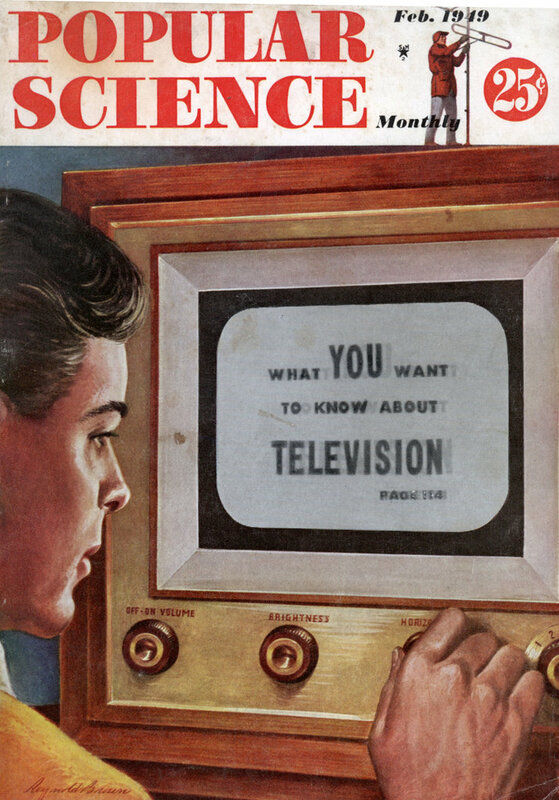 Then you should read the article, “Science Tries You Out On the Dog,” on page 151. 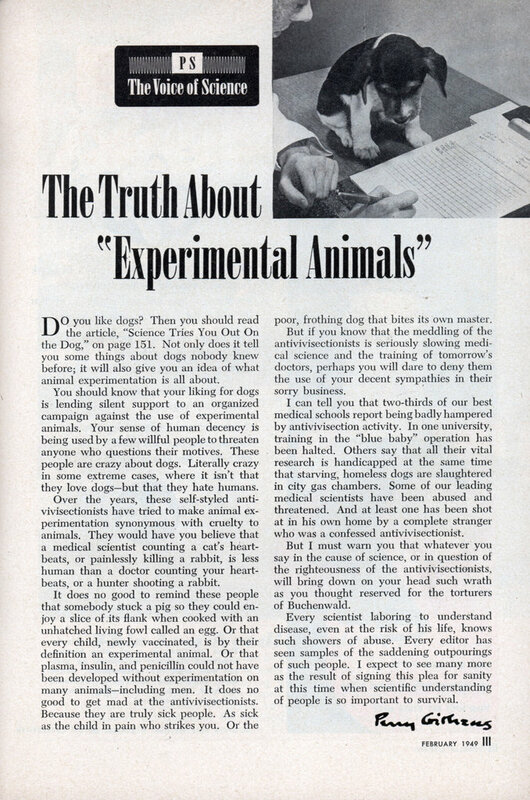 Not only does it tell you some things about dogs nobody knew before; it will also give you an idea of what animal experimentation is all about. You should know that your liking for dogs is lending silent support to an organized campaign against the use of experimental animals. Your sense of human decency is being used by a few willful people to threaten anyone who questions their motives. These people are crazy about dogs. Literally crazy in some extreme cases, where it isn’t that they love dogsâ€”but that they hate humans. Over the years, these self-styled anti-vivisectionists have tried to make animal experimentation synonymous with cruelty to animals. They would have you believe that a medical scientist counting a cat’s heartbeats, or painlessly killing a rabbit, is less human than a doctor counting your heartbeats, or a hunter shooting a rabbit. It does no good to remind these people that somebody stuck a pig so they could enjoy a slice of its flank when cooked with an unhatched living fowl called an egg. Or that every child, newly vaccinated, is by their definition an experimental animal. Or that plasma, insulin, and penicillin could not have been developed without experimentation on many animalsâ€”including men. It does no good to get mad at the antivivisectionists. Because they are truly sick people. As sick as the child in pain who strikes you. Or the poor, frothing dog that bites its own master. But if you know that the meddling of the antivivisectionists is seriously slowing medical science and the training of tomorrow’s doctors, perhaps you will dare to deny them the use of your decent sympathies in their sorry business. I can tell you that two-thirds of our best medical schools report being badly hampered by antivivisection activity. In one university, training in the “blue baby” operation has been halted. Others say that all their vital research is handicapped at the same time that starving, homeless dogs are slaughtered in city gas chambers. Some of our leading medical scientists have been abused and threatened. And at least one has been shot at in his own home by a complete stranger who was a confessed antivivisectionist. But I must warn you that whatever you say in the cause of science, or in question of the righteousness of the antivivisectionists, will bring down on your head such wrath as you thought reserved for the torturers of Buchenwald. Every scientist laboring to understand disease, even at the risk of his life, knows such showers of abuse. Every editor has seen samples of the saddening outpourings of such people. I expect to see many more as the result of signing this plea for sanity at this time when scientific understanding of people is so important to survival. BTW, Hitler and the NAZI party were considered Liberals, many liberals in the USA and other countries supported them. Of course they deny his liberal status now. Um, no. Hitler was not a liberal. Liberals believe in civil rights and social justice. Um, Hilter was a ultra right wing. He believed that businesses should prosper and that workers should not have any rights. In fact the Nazis employed millions of slave labourers. The word Nazi has its origin in German language. Nazi is used as a noun as well as a verb. Nazi is an abbreviated form for National Sozialistische Deutsch Arbeiter-Partei. It means National Socialist German Worker’s Party. Adolf Hitler’s National Socialist movement was, as the name clearly says, a party of the left. While not explicitly Marxist-Leninist, National Socialism accepted the essentials of that worldview while adding Germanic racial supremacism to the mix. This is not the place to lay this out in detail, but it is part of the historical record. Jonah Goldberg’s Liberal Fascism includes the best recent treatment of the subject. Thus it was not astonishing that in 1939 Hitler and Stalin found ample common interests to establish an alliance, nor did it astonish that Communist Party members in the West almost unanimously took up support for Nazi Germany. The alliance simply recognized the ideological kinship between the two. Sorry Charlie and JMyint. Hitler was a leftist. look, while Hitler may have called himself a socialist, zell miller calls himself a democrat (if you have not heard of him he is an ultra conservative politician). Hitler did indeed take away many civil liberties in germany and increase the power of german buisinesses, but on the other hand he did increase the power of the german government. I think that hitler had ideas from both sides of the spectrum. I think however that his political leanings are really irrelivant because liberals and conservatives alike can agree that he was just an all around evil person. look hitler’s political leanings are irrelivant, both liverals and conservatives alike can agree he was a horribly evil person. To make the argument about his political party is to simply turn the issue from a human rights one which it should be into a petty political argument. for instance: just because your great uncle went to jail for armed robbery, it does not mean that you condone his actions at all. Likewise, just because hitler was a liberal or a conservative, it does not meant that everyone in that group supports him.